The GOP-led U.S. Senate today confirmed ex-coal lobbyist Andrew Wheeler to run Environmental Protection Agency, in a 52-47 vote mostly along party lines. 52-47 The #Senate CONFIRMED Andrew Wheeler to be Administrator of the EPA. Senator Collins voted no joining all Democrats. Senator Sinema did not vote. Wheeler has been serving as “acting” administrator of Trump's EPA since Scott Pruitt resigned over alleged ethics violations in July, 2018. On the GOP side, only Senator Susan Collins (R-ME) opposed Wheeler, and voted against him. She described his policies as “not in the best interest of our environment and public health." Arizona Senator Kristen Sinema did not vote. Below, tweets from lawmakers who voted "no," and from journalists and environmental advocates around the time Wheeler's confirmation was completed today.
.@SenatorCollins just accidentally voted for EPA nom Andrew Wheeler and quickly corrected to a no. She kind of shook her head and laughed at her mistake. She was the only Republican to oppose the nominee. Senate Republicans just overrode bipartisan opposition to confirm ex-coal lobbyist Andrew Wheeler to be Trump Administration's next EPA Administrator. We need a strong EPA that will defend the right of every American to drink clean water & breathe clean air. That's why I'm on my way to vote NO on Andrew Wheeler's nomination to lead the EPA. We cannot allow a former coal lobbyist & climate change skeptic to head this agency. At this moment of growing harm from climate change, appointing someone to lead the EPA who has vigorously opposed our efforts to reduce carbon pollution.... would be like putting the Monopoly Man in charge of regulating big banks. I'm voting no on Andrew Wheeler to head the EPA. Andrew Wheeler has proven where his loyalties lie: to advancing President Trump’s agenda that seeks to chip away at our environmental laws & jeopardize public health for families in WA & nationwide. I’m heading to the floor to vote NO on Mr. Wheeler’s confirmation to lead @EPA. A former coal lobbyist in charge of protecting our environment? I don’t think so. I just voted against Andrew Wheeler to become EPA administrator. As a former fossil fuel lobbyist, he consistently worked against the public interest to advance an anti-environment agenda and dismantle many hard-won climate change programs. 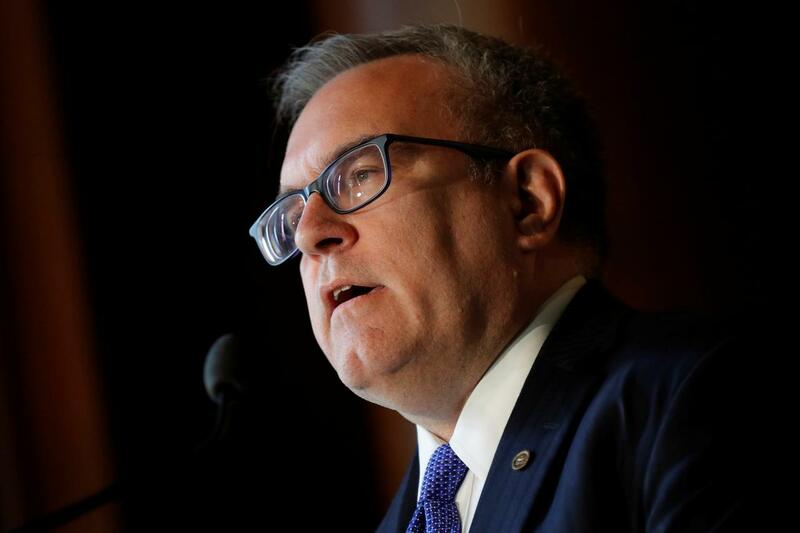 Throughout his career, Andrew Wheeler has shown a clear disregard for the EPA’s mission to protect the public and environment. As the author of the Ten-in-Ten Fuel Economy Act, I’m troubled by his attacks on clean car standards. We don’t need another anti-environment crusader.
.@Sen_JoeManchin also just voted "no" on @EPAAWheeler's top spot confirmation. The Democrat from West Virginia voted for Wheeler to be deputy administrator last year.